Mike’s Workshop is pleased to announce the arrival of a new product category - hand turned pens! Made from wood and acrylics in a variety of styles and finishes, these pens are sure to be a valued gift or keepsake. Please have a look as the inventory grows daily. Just click on Mike’s Pens above! 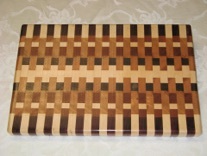 All items are hand crafted and made exclusively from hardwoods such as Maple, Cherry and Walnut. While many items may look alike, all are one of a kind. In fact, natural blemishes and variations in the color of the hardwoods - walnut and cherry in particular - often gives each piece a unique “character”. Please check the Upcoming Events page to see the location and date of shows in the Atlanta area that I’m participating in. You can also find information about good nutritional health by following the link to my Juice Plus+ website, www.mschuler.juiceplus.com. Juice Plus+ contains over 27 whole fruits, vegetables, berries and grains optimally blended together in convenient to consume chewable or capsule forms. Juice Plus+ helps bridge the gap between what we should eat and what we do eat. Check it out! And, if you love growing fruits and vegetables, but hate gardening, take a look at the Aeroponic Tower Garden at https://mschuler.towergarden.com/ !